How Do Rats Get Inside a Home? 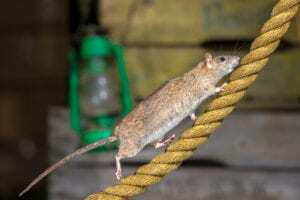 Rats are one of the most common and annoying invasive species which often end up finding their ways into homes, businesses, cars and many other places which they are not welcome in. The small creatures are adept at finding different ways into a home or restaurant, and once they are inside, they make sure to damage the dwelling, cause havoc and reproduce at alarming rates. As such, it is important to understand how exactly these rats get inside a home. The most common way that rats find their way inside a home is through cracks in the foundation or in the external walls of a house. Rats are small and can wriggle their way into and through holes as small as two inches in diameter. Such openings can be common at the ground level of a home, especially if weather and/or time has worn down an older home. Being vigilant about keeping track of such openings can help prevent rats from entering the home. Another very common method of entry for rats is through similar methods on the attic or roof of a home. Holes in the tiling or shingling of a house can be common, as such areas are not inspected often. Additionally, poor attic insulation can provide another entry point for the rat and also a popular place to live. If you have poor insulation in your home, it could be due to an opening in the foundation of the home, which also opens the opportunity for a rat invasion. Once inside the attic, rats will begin to leave droppings and waste, making it important to keep them from entering. The most frustratingly common way in which a rat can enter a building is through pipes. What makes this especially frustrating is that there is very little that homeowners can do to prevent such invasions from happening, as most pipes are vital to the well-being of the home. Plumbing, electrical and cable lines require holes in the house and serve as a welcome mat to many species of rats. Such rats will chew through cables or gnaw at an opening in the wall or pipe with their strong teeth. Pipes which are poorly sealed or insulated at the base of the wall represent an easy ticket for rats. If you notice rats near or on your property, call the experts at Shumaker Animal Control to deal with the problem for you. Our experienced team will take care of the problem in a timely manner, ensuring that your home is not damaged any further by the rats. Call us at 443-854-8072, view our website or fill out our contact form for more information. This entry was posted on Monday, January 21st, 2019	at 4:04 pm	. You can follow any responses to this entry through the RSS 2.0	feed. Both comments and pings are currently closed.